My last post was about the installation of Windows Developer Preview. But for those who are not sure what Windows Developer Preview is all about then here is something! 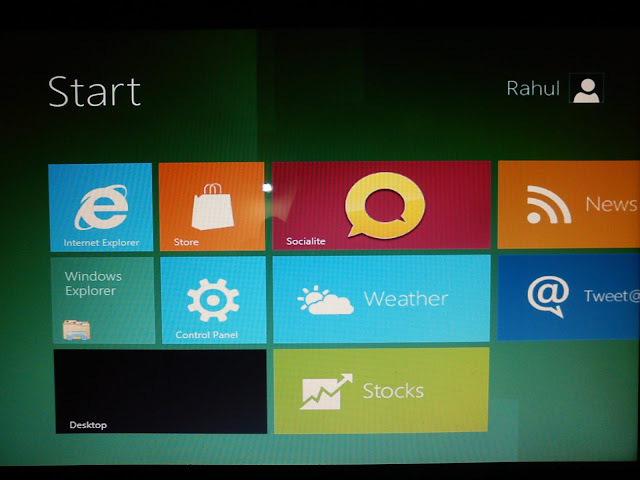 Windows 8 is the upcoming Operating System from Microsoft Windows family. There were speculations about new version of Windows since long but they actually ended when Microsoft officially announced the release of Developer Preview. Windows Developer Preview is the test version of Windows 8 that is released by Microsoft for the developers and testers. So, if you want to get a hands on to the yet to release version of Windows, it is for you. Windows 8 aspires to be the next big release in the market and it doesn't seem to be just another version of Windows OS but a giant leap forward for the world's number one Operating System manufacturer. Windows 8 will be the operating system not just for traditional PCs but for every other device that runs a featured Operating System. This includes desktops, laptops, netbooks, and tablets. The usual Windows desktop is transformed by what is called Windows start screen that has all the applications that you want to use just a click or touch away. That's just at the face of it, otherwise it also has many new developments inside that makes it really interesting. These new features are yet to be fully revealed and experienced. Here is a video from Microsoft that will give you some idea. The first thing I felt after getting aware of this was "Wow, I want to check it out!" and yes, it is possible through Windows Developer Preview. And do vote em if you find them interesting. "Sony Ericsson" to become "Sony"!! Know Hindi? or Want to Learn Hindi? Check this out! Of Suggested Posts on Facebook and Can we get rid of them? SMS Limit Busted, Freedom Regained!